Politics in the heat is fast becoming an annual VACo summer tradition. With primaries completed and November elections approaching, VACo’s County Officials’ Summit once again brought politics to its members. This year nearly 150 county leaders heard from U.S. Senator Tim Kaine and U.S. Senate Candidate Corey Stewart. Virginia’s 5th Congressional District Candidate Leslie Cockburn and Virginia’s 7th Congressional District Candidate Abigail Spanberger also enlightened the bipartisan crowd with their vision for local government. Tying Virginia’s elections and political climate together with expert analysis was Dr. Bob Holsworth. Kaine explained his campaign theme of a “Virginia that works for all” and added that expanding broadband infrastructure investments was vital for the state’s future. Kaine compared broadband to electricity, and said that just like bringing electricity to the rural areas in the 1930s and 1940s, Virginia must do the same with broadband now. He stressed that closing the digital divide ensures that all parts of Virginia can compete in the global economy of the future. The Senator suggested that collecting sales taxes on online purchases can help pay for much-needed infrastructure. He also said that many of the online purchases are delivered to the home or office by truck using the state’s roads. An online sales tax could also provide funds for transportation infrastructure. Stewart, Chairman of the Prince William County Board of County Supervisors, agreed with Kaine about the need for universal broadband. He also emphasized the importance of minimizing federal mandates on local governments. Stewart shared strong opinions on the issue of school safety. He said he opposed “gun-free zones” in schools. Currently only active or recently retired law enforcement officers can have guns in public schools. The Chairman suggested the federal government help more with hiring “armed guards” for all schools in Virginia. He also said he supports training teachers to carry concealed guns in school. After listening to the candidates, VACo members convened for steering committee meetings. The committees are gearing up to write VACo’s Legislative Program for the 2019 General Assembly Session. Below are three presentations given during committee meetings. 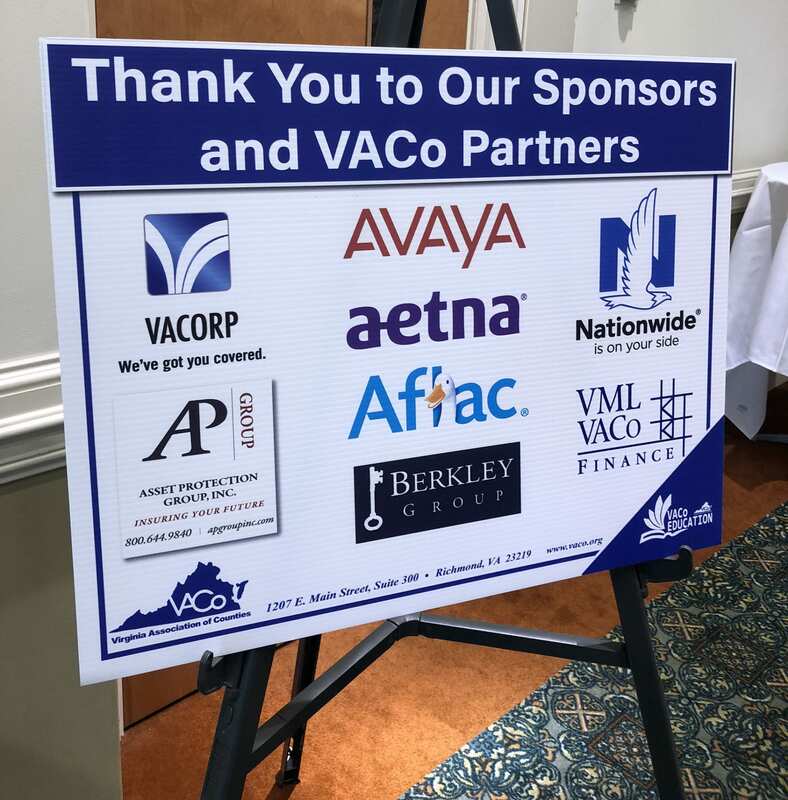 See the Fredericksburg Free Lance-Star coverage of VACo’s County Officials’ Summit.